Major debate issues included job creation and economic recovery following the Great Recession of 2007-2009, and modest economic growth worked in Obama’s favor. Republicans promoted laissez-faire government and sought to repeal the Affordable Care Act (“Obamacare”), a sweeping health care initiative signed into law by President Obama in 2010. Counter-terrorism, U.S. withdrawal from Iraq, and the prospect of Iran as a nuclear power were foreign policy concerns raised during the campaign season. For the first time, Super PACs, operating without legal limits to political spending, played a major role in presidential politics. The involvement of Super PACs contributed to unprecedented levels of fundraising and negative ads. Paul Ryan of Janesville became the first Wisconsinite to appear on a major party presidential ticket. 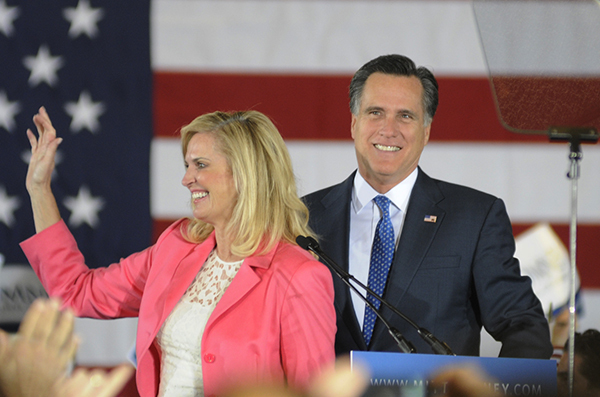 Former Massachusetts Governor and Republican Presidential candidate Mitt Romney takes the stage with his wife Ann to give his victory speech at his headquarters at the Westin at Copley Plaza on Super Tuesday. 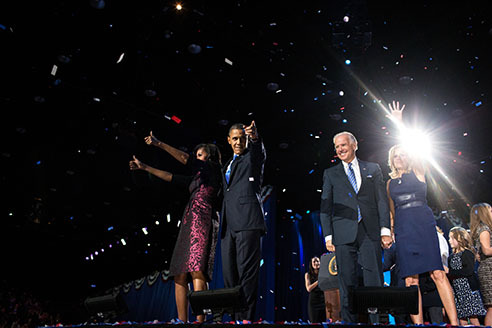 (Ryan Hutton/Boston University News Service)"
United States President Barack Obama, First Lady Michelle Obama, Vice President Joe Biden and his wife Jill Biden at McCormick Place in Chicago early on 7 November 2012 following the the President’s election night speech.